A few houses, a service station, a post office, a couple of diners... and a mysterious scientific research base. Gakona, a small village in the center of Alaska, is home to the American HAARP research program (High-frequency Active Auroral Research Program). Inspired by the works of the inventor Nikola Tesla, it is believed that researchers there are studying the transmission of electricity in the high strata of the atmosphere. But because of its military funding and the fears associated with electromagnetism, HAARP has also become an inexhaustible source of rumors. From climatic disruption to influence over human behavior, this forest of antennas has been credited with powers worthy of science fiction. 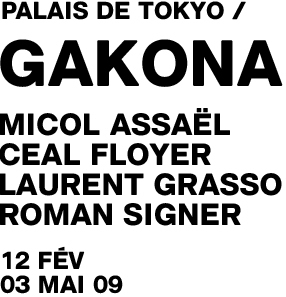 Made up of four solo exhibitions (Micol Assaël, Ceal Floyer, Laurent Grasso and Roman Signer), the GAKONA session lies at the intersection of fact and rumor, reality and phantasm, science and imagination. Presenting works that elude any suggestion of a fixed interpretation, it thus pursues the Palais de Tokyo’s intention of promoting a dynamics of looking and thinking, based on a permanent oscillation between opposite poles. Opening every first Thursday of the month. Discussion and screening with the artist. Reduce smartly (and by all means) your consumption and production of electricity. with : Benjamin Cadon et Ewen Chardronnet. About picking up, usage and application of brainwaves to electric devices, computers and video games. with : Gary McDarby (Dublin), Alexis Chazard (Paris, artist). with : Jean-Baptiste Labrune and Dana Gordon (Boston), Joëlle Bitton (Paris) and other people of Dorkbot. Make, Upgrade, Dorkbot, Artbot… : a cartography of informal networks which gather artists, scientists and geeks all around the world. with : Douglas Repetto (USA, creator of Dorkbot and Artbot). Open workshop. Creation of musical instruments with old electronic games, keayboards, drumboxes… Performances/concerts in the evening. with : Gijs Gieskes (Netherlands, musician). with : Jonah Brucker-Cohen (New York, artist and teacher at the Interactive Telecommunications Program) and Katherine Moriwaki (New York, artist and teacher at the Parsons). Hommage to Aerne Ness and discussion around the ecological consequences of the electrification of the world, on the occasion of the publication in French of Ecology, Community and Lifestyle. with : Patrick J. Degeorges, Jean-Baptiste Fressoz, Thomas Parke Hughes. Entry on presentation of the ticket to the exhibition (6 euros - 4,50) or Tokyopass. New issue around Gakona: a Nikola Tesla short story by Cory Doctorow, an interview of Laurent Grasso by Marc-Olivier Wahler, two portfolios (Ceal Floyer, Roman Signer), archive documents about Alexander Chizhevsky (selected by Micol Assaël), unexpected experiments with high-voltage current, and also a guide section. Free with full-price entry ticket.